The name was given to the village by Count Christoph of Nitzky, who used to be principal of Temes County and settled the village with southern German colonists in 1784. Niţchidorf (German: Nitzkydorf, which translates as Nitzky village) possesses all characteristics of a “Josephinist settlement”: standardised streets, measured settlement area, regulated distances between drainage and houses and drinking water fountains on street intersections. 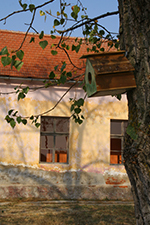 The village gained some fame after Herta Müller, who is from Niţchidorf , was awarded the Nobel Prize for literature in 2009. Suddenly, the village and its inhabitants attracted public attention. In her works, Herta Müller paints the world of her childhood in dark and oppressive colours. On the outside, Niţchidorf has been unchanged by the Nobel Prize-furore. However, the village is excitedly waiting for a visit of its famous daughter. Herta Müller sent the major of Niţchidorf one of her books and promised him to visit. Thanks to a dedicated teacher of Romanian, the youth of the city is now dealing with Müller’s works in school. 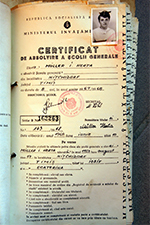 The school and matriculation lists in which she is recorded are shown around proudly as well as her school certificates. Some old inhabitants of Niţchidorf can still remember Herta Müller. Thus, the cemetery guard tells the story of her sneaking around the village to the cemetery to visit her ancestors. The Roman-Catholic church (1825) is located at the centre of the village. In the works of Herta Müller, going to church does not play as major a role as in traditional Swabian life of Banat. The Romanian-Orthodox church was established in 1996. It is a church for later settlers, who came to Niţchidorf after the Swabians had left. LEFT: Final school certificate of Herta Müller after grade eight. 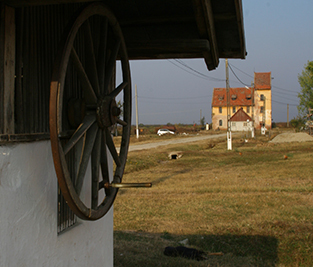 RIGHT: Many houses on the southern hills of the Sila vineyards are abandoned nowadays. Mill and fountain: two things that can be found in many Swabian villages of Banat.